Because of our special relationship with John Suhr we can get this as fast, or faster than anyone in the industry. In some cases, we even have preferred build slots we can offer you. Amazing versatility with shimmering single coil tones with warmth from the neck humbucker (SSV) and giant crunch from the bridge (SSH). 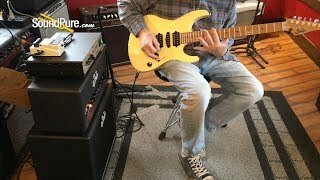 In this video, Sound Pure guitar specialist Eddie Berman makes a quick demo of a stunning Suhr Custom Modern Antique Vintage Yellow Electric guitar #JS7M6K.